Prior to 2014, I knew little to nothing about it. Seriously, nada. My first glimpse was on the big screen, courtesy of Clint Eastwood's film version (read my review here.) Then a few months later, I got to see the real McCoy (Frankie Valli & The Four Seasons) live at the Strathmore Music Center. I thought I knew it all; but until you see it live on stage, nothing can (properly) prepare you for the fun that follows. I must admit: I was a bit nervous early on, as the production opened with a very un-Jersey-like rap performance (in French, no less.) What was this... Paris Boys? Thankfully it didn't take long for Tommy DeVito & company to take center stage, and "restore order." Tommy, superbly played by Matthew Dailey took first dibs on narration, explaining a Jersey boy only has three career options, "Join the army, get mobbed up or become a star." Tommy sets his ears & eyes on the latter, enlisting the services of falsetto extraordinaire Valli (Aaron De Jesus) before taking turns in and out of trouble (and in some cases, prison.) The rest, as they say, is history. 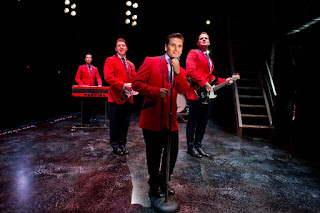 Jersey Boys is beloved for its music, and with good great reason; but what I love most, is the trueness of its characters. What you see, is definitely what you get. These guys (and gals, more on them later) are down-to-Earth and fun/naughty. They're interesting to watch (what a concept!) so when they start singing, it's merely an extension of their greatness versus an irksome break in the action. Keep in mind, I'm not much of a "musical" guy either. The show also benefits from great lighting (Howard Binkley) and an ever-changing stage that looks simple at first (one catwalk, two flights of stairs and a street lamp that pops in & out) but comes alive with lightning fast transitions and a genius video angle of live performances ("Sherry," Ed Sullivan Show) There's also a smart marquee that lights up, and tells you where you are (Strand Club, Police Station, etc.) My favorite moment? Right before intermission, when the stage flips around, and we watch the boys perform from behind, basked in the warm glow of a dozen or so spotlights. So that's what it feels like to be a rock star. Talk about immersive! The second half is comparatively more somber, as Nick Massi (Keith Hines) and Valli take over narrative duties. Gone is the cheer and hoopla, replaced by betrayal, failed relationships and even death. It sets the table for a comeback/reunion, of course; but I'd much rather replay the more upbeat first hour +, even if it meant missing out on terrific renditions of "Can't Take My Eyes Off You," and "Rag Doll," and a sentimental last word from each of the narrators. Looking back, I'm rather amazed I liked loved it so much. After all, it has a lot of music (30+ songs) and it's pretty long (over 2½ hours with an 18-minute intermission.) Perhaps I'm getting soft/softer in my old age? Or maybe I really am a Jersey Boy at heart. "Two cars, three girls and four guys. Infinite possibilities." Infinite indeed. 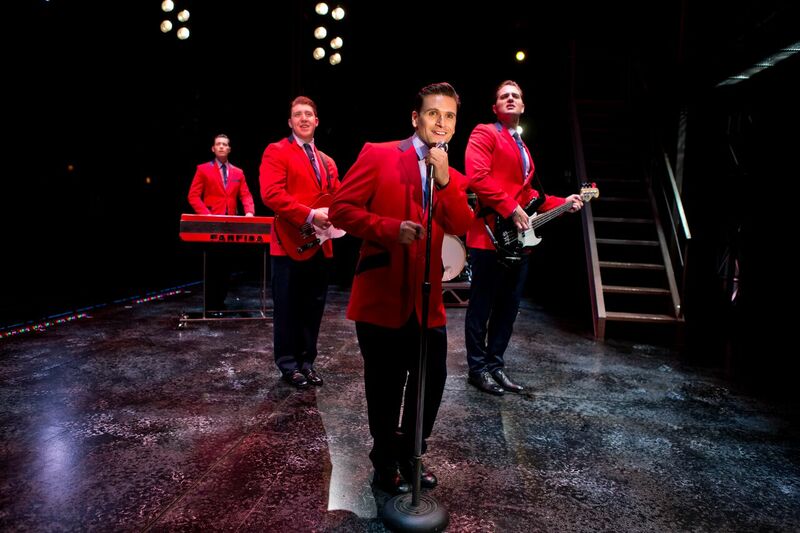 Jersey Boys continues at the National Theatre through Sunday, April 24th. Click here to purchase tickets.